Ike Opara scored his third goal of the season on a leaping header of Johnny Russell's corner kick. 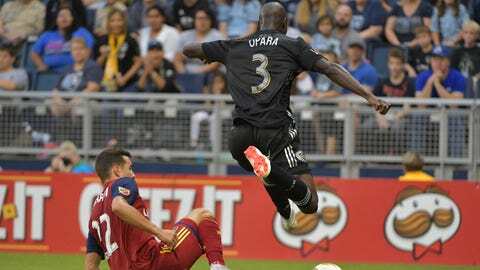 KANSAS CITY, Kan. (AP) — Ike Opara scored the tying goal in the 52nd minute and Sporting Kansas City played Real Salt Lake to a 1-1 draw Sunday. Sporting K.C, (15-8-7) is two points behind first-place FC Dallas in the Western Conference. Real Salt Lake (13-11-7) sits two points shy of fourth-place Portland — with the teams facing off twice in the final three regular-season games. Opara scored his third goal of the season on a leaping header of Johnny Russell’s corner kick. Corey Baird gave RSL the lead in the ninth minute. He ran past the defense for Jefferson Savarino’s through ball and scored his first goal in over a month. RSL goalkeeper Nick Rimando came out of his area to deny a breakaway attempt in the 81st and he made a kick save of Diego Rubio’s open shot in the 87th.